Marlborough/Hudson – Some teenagers might be happy to spend their summers on the couch, but five charismatic girls from Marlborough and Hudson spent their summer working to help children who are often hidden in the shadows. 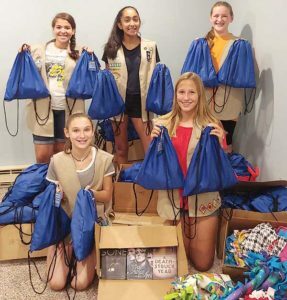 Members of Troop 65022, Alysa Oldham, Maria Barreto, Marisa Coye, Anjali Sangappa and Calleigh Walsh collaborated to help put together “Bags for Kids.” The project took months to complete, and showed the girls’ commitment to helping their community. The girls worked to understand the foster care system in Massachusetts and in their hometowns. After speaking with the Department of Children and Family Services and local foster parents, the girls wrote to local businesses requesting donations to help foster children in the area. They spent their summer assembling bags, which were filled with oral and personal hygiene items. To best help the children, the girls also created a brochure outlining why they put together the bags, and the importance of mindfulness. In total, the girls were able to assemble and donate 150 bags to local children in foster care. Their work on this project culminated with a presentation at Hudson Public Library Aug. 29. Together, the girls’ work helped them to earn the Silver Award – the second highest award in Girl Scouts for a Take Action project for their community. 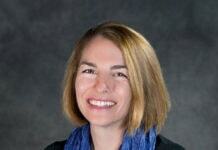 Their real reward was understanding the positive impact that they had on their community.